The family of a Saskatchewan man who was shot and killed by an RCMP officer will finally learn details about what led to their son's death during a coroner's inquest this week. 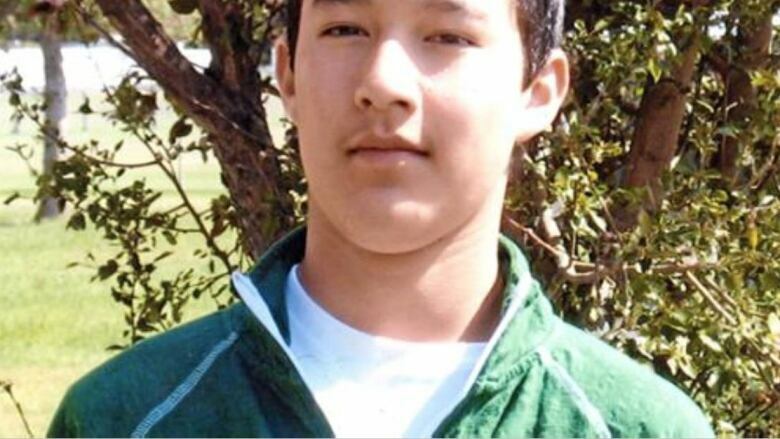 The inquest into Brydon Whitstone's death got underway in Battleford Monday. Read about what the jury heard here. An RCMP officer in North Battleford fatally shot 22-year-old Brydon Whitstone of Onion Lake Cree Nation following a brief police pursuit on Oct. 21, 2017. A coroner's inquest into Whitstone's death begins Monday at the Battleford Court of Queen's Bench building. The inquest jury will rule on how Whitstone died and be asked to make recommendations on how to prevent similar deaths. 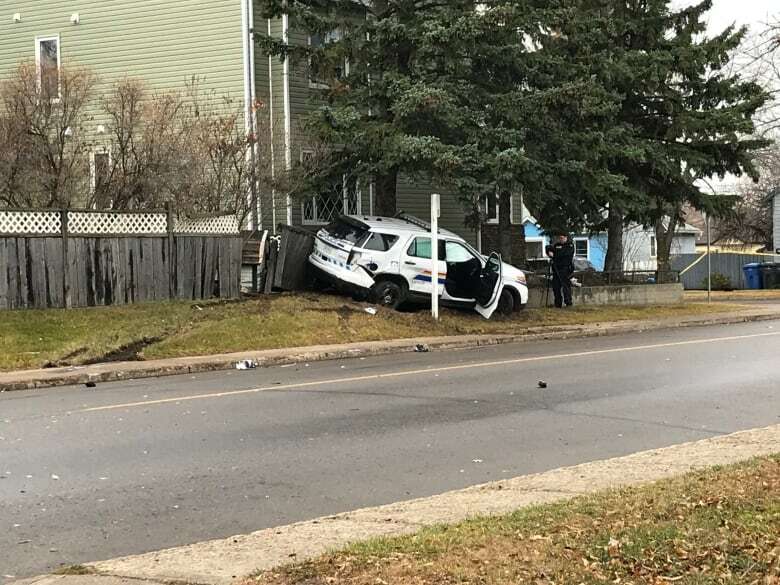 Authorities have said little about Whitstone's altercation with the RCMP, except that the car Whitstone was in rammed a police vehicle and that the officer responded to Whitstone's actions that night. 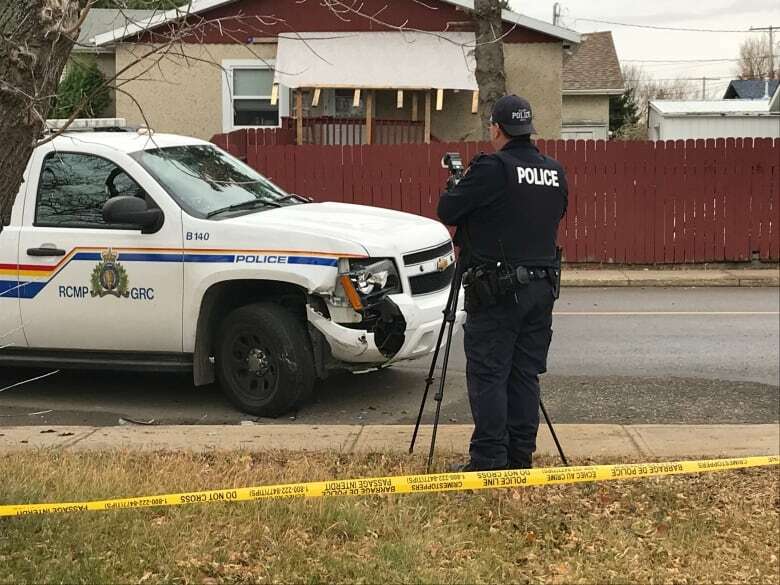 Justice officials recently confirmed that, after reviewing the Regina Police Service's investigation of the shooting, no criminal charges will be laid against the RCMP officer. The only detailed account of that night has come from Amanda Wahobin, who was in the front passenger seat of the SUV in which Whitstone was shot. Wahobin told CBC News there was no gun in their vehicle but that Whitstone pretended to reach for something. She said a police officer shouted that Whitstone was grabbing a gun before police fired on Whitstone. Accounts from other witnesses offered at the inquest will now test Wahobin's account. Don Worme, the lawyer whose firm is representing Whitstone's family, said he expects around 20 witnesses to testify. That's not counting any additional witnesses called by Worme. His office was unsure whether Wahobin would end up on the final witness list. Worme was fairly certain that the RCMP officer who shot Whitstone, whom he called an "absolutely essential witness," will be among those called by the coroner's counsel, who will stick handle the inquest proceedings. The Ministry of Justice, which handles communication for the Saskatchewan Coroners Service, would not confirm the witness list. What steps did the RCMP take before shooting Whitstone? Photos and video taken the day after the shooting showed not one but two noticeably damaged police vehicles near the intersection of 105th Street and 15th Avenue, where Whitstone was shot. They also show Whitstone's car surrounded by three other vehicles at the intersection. A video of the altercation, taken from a distance, shows RCMP officers shouting at the car. The RCMP has said it expects to disclose "all investigative and enforcement steps that were taken with the ultimate goal of ensuring public and officer safety." The shooting has also sparked an internal code of conduct investigation within the RCMP. "We will speak to the case after the inquest has concluded," the RCMP said in a news release Friday. "The RCMP welcomes the coroner's inquest as it is a fact-finding process that will allow for full disclosure of the facts. Our ultimate goal is to ensure public and officer safety." What happened during those 45 minutes? The RCMP has said it received a complaint at about 8:55 p.m. CST that night about people shooting at a man from a vehicle. That complaint led to the chase between Whitstone and the RCMP but was later tied to a different suspect. Forty-five minutes later, at about 9:40 p.m., Whitestone was pronounced dead while en-route to the hospital. For a timeline of the shooting and its aftermath, click here. Albert Whitstone, Brydon's father, said he hopes inquest testimony and RCMP dashcam footage will flesh out why, in his mind, it took so long to take his son to the hospital after he was shot. The nearest hospital to the intersection of 105th and 15th, Battlefords Union Hospital, is a four-minute drive away. "Life-saving measures were immediately provided by RCMP members until local EMS arrived and took over," the RCMP said after the shooting. Will this inquest be different? 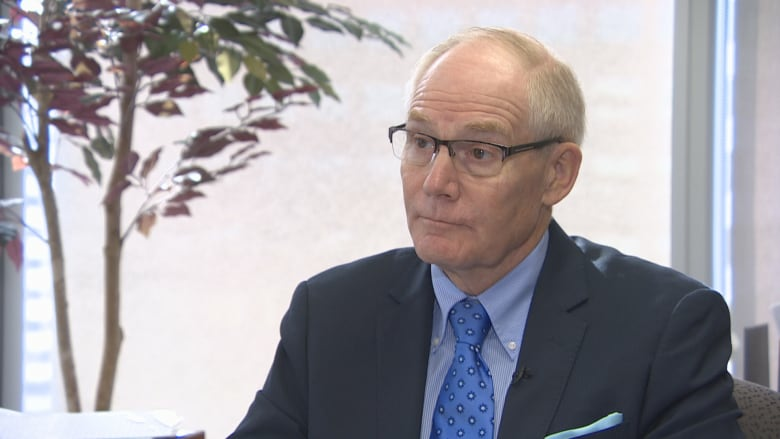 The Whitstone inquest is only the second to be held under the watch of Saskatchewan's new chief coroner, former Saskatoon police chief Clive Weighill. A few months before taking office, Weighill released a report with recommendations on how he thought the inquest process should be improved, including the addition of an advocate for families going through the process. Weighill also made an observation that one Saskatoon lawyer and inquest veteran, Ammy Murray, took as a jab at inquest lawyers. Weighill said the cost of inquests was rising partly due to lawyers treating inquests like criminal trials and "longer questioning and cross-examination of witnesses." Saskatchewan coroner's inquests: What are they good for? During one inquest, Murray represented the family of a woman, Shauna Wolf, who died after being found unresponsive in her cell at Prince Albert's Pine Grove Correctional Centre. Cross-examination by Murray helped establish that Wolf didn't die at the hospital, as originally recorded on her death certificate, but two hours before, in her cell, "up to two hours before anybody checked on her." "Yeah, it made the process longer," said Murray of the cross examination, "but it also brought out the truth. It also brought out the facts. Is that a bad thing?" Ron Piche, a Saskatoon defence attorney, agreed that cross examination is an important tool for bringing out the whole truth. "The particulars of what transpired on [the night Whitstone died] are still a little bit in doubt. That's why I think the tool of cross examination would be instrumental." The inquest into Whitstone's death begins with jury selection at the Battleford Court of Queen's Bench building at 10 a.m. CST. 8:55 p.m. CST (approximate): Battlefords RCMP officers respond to a complaint about a man being shot at by people inside a car. Some time between 9 p.m. and 9:30 p.m.: Wahobin and Whitstone notice police cars driving down nearby 11th Avenue, according to Wahobin. They then set out on foot and borrow the car in which they elude police in the lead-up to the shooting. At some point during the police chase, the car Whitstone was in rams a police vehicle, according to the RCMP. Wahobin, who was in the passenger seat of Whitstone's car, says the collision was accidental. 9:40 p.m. (approximate): Whitstone is pronounced dead en-route to the hospital. October 22, 2017: The RCMP releases a public statement announcing the shooting and confirming Whitstone's death. The RCMP says the officer shot Whitstone "in response to the driver's [Whitstone's] actions." The Regina Police Service is tapped to investigate the shooting. March 2018: Regina Police Service says its report into the shooting is in the hands of the province and an independent investigation observer (typically an ex-cop with major crimes experience) appointed by the province. August 18, 2018: Dorothy Laboucane, Whitstone's mother, tells CBC News a coroner's inquest into her son's death will be held. The province confirms. 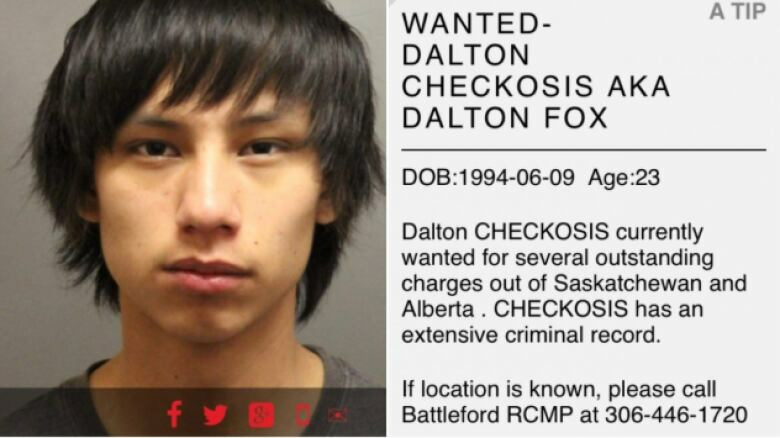 August 25, 2018: The RCMP confirms that the person responsible for the original shooting complaint that led to the RCMP's pursuit of Whitstone was not Whitstone but rather 24-year-old Dalton Checkosis. The RCMP says Checkosis was charged with unauthorized possession of a firearm, possession of a weapon for a dangerous purpose and breach of recognizance. 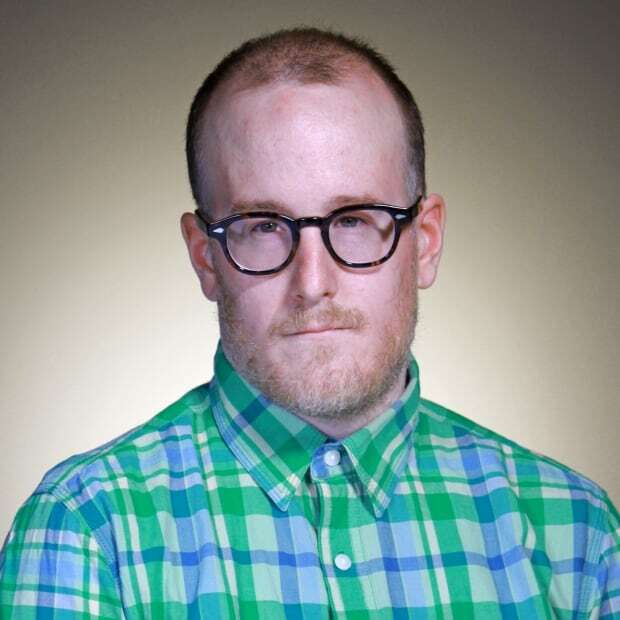 Checkosis is ultimately convicted only of breach of recognizance and criminal harassment and sentenced to six days in jail, factoring-in time served. September 25, 2018: The Ministry of Justice says Crown prosecutors have found no basis for criminal charges against the RCMP officer who shot Whitstone. October 21, 2018: Laboucane visits her son's grave on the one-year anniversary of his death. Six days later, she holds a traditional feast in his honour. December 3, 2018: The one-week coroner's inquest begins.